There’s a new TV in town – The StarTimes 40″ Digital 3-In-1 LED TV that comes with 2 months free subscription and features High Definition resolution and 2 built-in decoders that allow you to connect to the stations you love seamlessly and enjoy TV content like you’re used to. 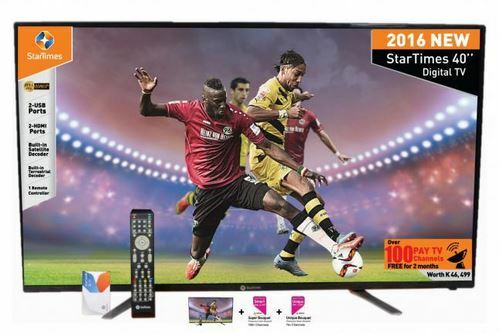 The StarTimes TV, featuring a 40 inch LED (Light Emitting Diode) display size comes with 2 months free subscription and is available on the Jumia Kenya website here for just KES 46,499. Content available on the TV include the NBA League on NBA TV, MCS Sports, Euro sports news, STV Kungfu, and our very own Exclusive StarTimes sports channels; Sports Arena, Sports Premium (HD), Sports Life, World Football (HD) . Other exciting channels available on this unit are like BBC World, MSNBC, WAPTV, StarGold, B4U Movies, Bollywood TV, AMC Movies, Nat Geo Gold, Nickelodeon and with lots of new channels set to be unveiled on the platform soon. As far as after-sales services go, StarTimes provides good gquality service for all customers from the customer hot-line +254-719-077-077, from business halls and dealers on issues of activation, renewal, and new purchases. You can also get help online from the StarTimes Facebook and Twitter profiles on @StarTimesKenya.